Description : The New York Times had a major scoop today &mdash; on The New York Times. Turns out, they were hacked. In fact, they were hacked for several months. Chinese hackers stole the corporate passwords for every employee of New York Times. In addition, they gained access to home computers of several of the journalists. 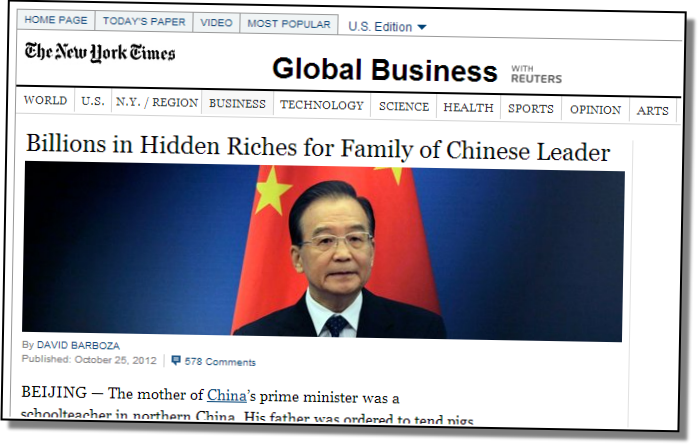 These attacks started right after the newspaper published a revealing investigation on the relatives of Wen Jiabao, China's prime minister. Screenshot of an article written by David Barboza. His e-mail account was breached by the attackers. It's worth noting that no customer data was stolen. These attackers were not interested in making money. They wanted to spy on The Times. China's Ministry of National Defense's response to the allegations: "To accuse the Chinese military of launching cyberattacks without solid proof is unprofessional and baseless". Journalists have been targeted by similar attacks before. In some cases, journalist names have been used as a lure in targeted attacks. For some commentary on the news from Chinese side, see this blog post from Liz Carter.